Figure 18.1. Serum λ FLCs and IgAλ in a patient showing FLC escape. FLC escape was apparent as a conversion from IgA production to FLC only. (Courtesy of Christie Hospital). Figure 18.2. Clonal changes during the course of disease assessed using a combination of HLC and FLC analysis. The κ sFLC concentration (blue) and IgAκ/IgAλ HLC ratio (red) are shown. Dashed lines indicate the upper limits of the respective reference ranges. 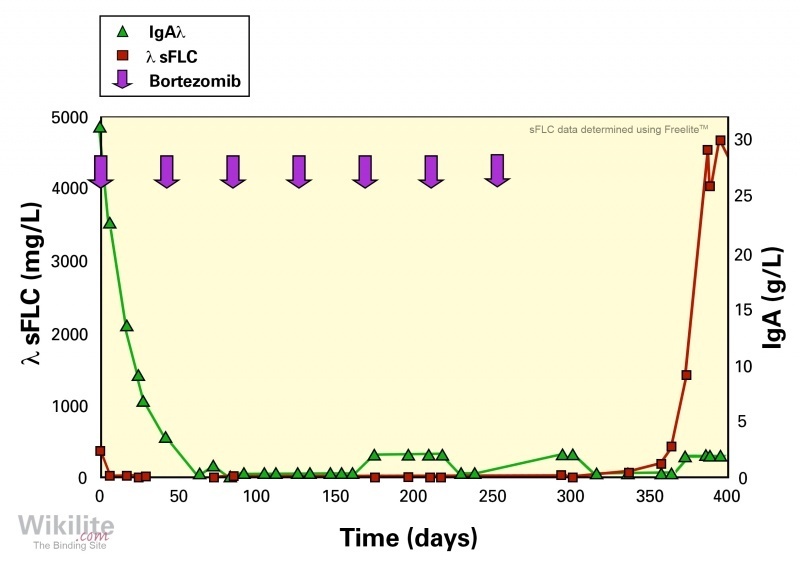 The patient presents with clones expressing IgAκ and κ sFLC and achieves a CR around 500 days after treatment, at which time both IgAκ/IgAλ and κ/λ sFLC ratios normalise. After around 750 days, a clone emerges that expresses IgAκ but not κ sFLC. The IgAκ clone is reduced but not eradicated after a second round of treatment. After approximately 2000 days, the patient relapses with clones expressing both IgAκ and κ sFLC. Figure 18.3. Laboratory test results at diagnosis. (A) SPE; (B) sIFE; (C) plasma cell morphology (bone marrow aspirate). Results during follow up: (D) serum monoclonal immunoglobulin quantitation; (E) κ sFLC analysis. Results at relapse: (F) SPE; (G) Plasma cell morphology (bone marrow aspirate). (Courtesy of B. Gamberi). The first published observation of FLC escape was made in 1969 by J.R. Hobbs while monitoring patients in the first UK myeloma trial . He noted that 5% of patients producing intact monoclonal immunoglobulins relapsed with only Bence Jones proteinuria. In addition, the relative proportion of monoclonal urine FLCs increased in a further 35% of patients at relapse. Other examples of light chain escape detected by urine analysis have been described . Guidelines state that without periodic urinary evaluations or sFLC measurements, the phenomenon of FLC escape can be missed . 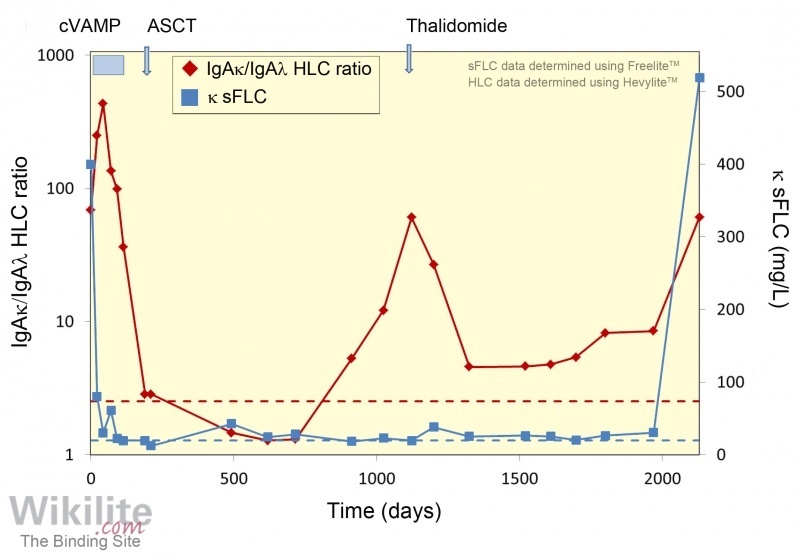 The increased use of sensitive sFLC immunoassays has resulted in an increase in the observed incidence of FLC escape . A typical example is shown in Figure 18.1. Brioli et al. reported that in a large study comprising 520 intact immunoglobulin multiple myeloma (MM) patients, FLC escape occurred in 10% of patients at disease relapse. The authors classified FLC escape as a failure to meet the IMWG criteria for relapse by a change in intact immunoglobulin levels, but satisfied IMWG criteria for changes in sFLC levels (Section 25.3) . These patients represented 6.5% (24/369) of IgG patients and 19.9% (30/151) of IgA patients. In 85% of FLC escape patients, the increase in the involved sFLC was >200 mg/L, which is the minimum level recommended for defining a relapse that requires treatment in the absence of clinical symptoms . Interestingly, any patients relapsing with sFLC involvement (either FLC escape alone or with intact immunoglobulin) experienced significantly shorter survival times than those relapsing with intact immunoglobulin only ; this is discussed further in Section 20.3.3. A lower prevalence of FLC escape was reported by two further studies: Caillon et al. reported that 3% (9/267) of IIMM patients enrolled in the IFM 2009 trial relapsed with FLC escape, and a German group reported an incidence of 2.46% (10/407) for MM patients treated at a single institution between 2004 and 2007. Kühnemund et al. reviewed clinical symptoms that were present at FLC escape, and found that renal impairment was a common feature, being present in 50% of cases. As renal impairment is associated with significant morbidity and mortality (Chapter 26), it is important to identify FLC escape early, and thus avoid serious complications. Typical examples that demonstrate the use of sFLC measurements to provide early detection of FLC escape are described in the clinical case below and in a recent publication . Insight into the mechanism of FLC escape has been proposed by Ayliffe et al. 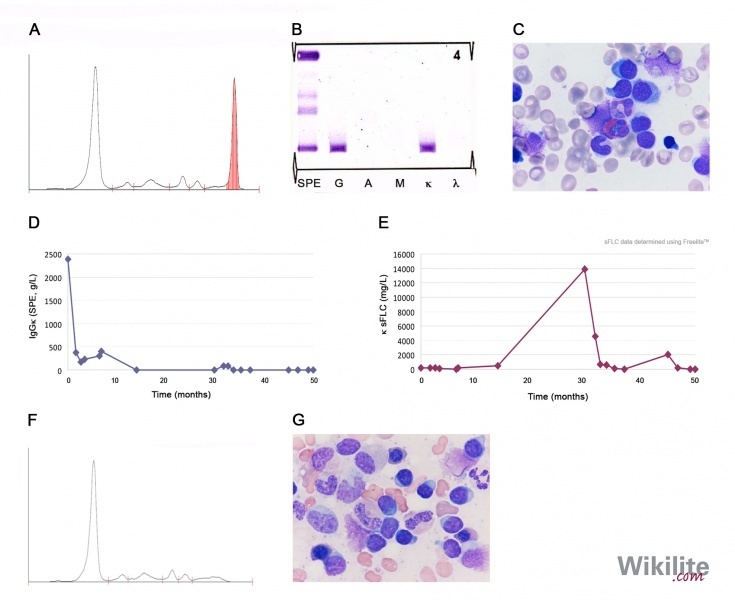 , who identified dual plasma cell clones in a proportion of patients with IIMM, with some cells expressing intact immunoglobulin (with or without FLC co-expression) and others expressing FLC alone. Disease relapse may be associated with the selective outgrowth of one of the clones, influenced by a combination of factors, including the tumour microenvironment and the patient’s treatment regimen (Chapter 19). In line with this, a number of researchers have proposed that FLC escape has become a more frequent occurrence with modern and more aggressive chemotherapy . Another form of disease relapse, termed clonal change, was proposed by Hobbs et al. and describes an alteration in the relative proportions of intact immunoglobulins and FLCs produced. Such changes are consistent with evolving tumour cell clones during the course of disease, and are demonstrated for an IgAκ MM patient in Figure 18.2. Zamarin et al. studied the incidence of changes in monoclonal protein type at relapse or disease progression in MM patients who had achieved a complete response (CR) after an autologous stem cell transplant (ASCT). A total of 54% (29/54) of IIMM patients had a change in their monoclonal protein type at relapse or progression of disease (Chapter 19). These observations highlight the importance of using both FLC and intact immunoglobulin measurements to monitor disease progression. An IgGκ multiple myeloma patient exhibiting FLC escape . A 62-year-old male was diagnosed with MM (ISS stage I, del 13q14) in February 2010. SPE identified a monoclonal protein of 23.8 g/L (Figure 18.3A), which was typed by sIFE as an IgGκ (Figure 18.3B). κ sFLCs were 178 mg/L. A bone marrow biopsy indicated 35% plasma cells (Figure 18.3C), and multiple costal fractures were present. After induction therapy with VTD (bortezomib, thalidomide, dexamethasone), the patient received high-dose therapy and an autologous peripheral blood stem cell transplant (PBSCT) and achieved a complete remission (negative sIFE and a normal κ/λ sFLC ratio). Two years later, κ sFLCs rapidly increased to a maximum of 13,900 mg/L, whilst SPE remained negative (Figure 18.3F) with a trace of the IgGκ visible by IFE. At this time, the patient was anaemic (10.8 g/dL) and bone marrow plasma cells were 90% (Figure 18.3G), consistent with FLC escape. The patient was treated with VCD (bortezomib, cyclophosphamide, dexamethasone) and a second autologous PBSCT, followed by VD consolidation therapy. The patient achieved a complete remission (normal bone marrow aspirate, negative sIFE and normal sFLCs: κ 15.5 mg/L). Seven months later, disease relapse was associated with an increase in κ sFLCs to 2820 mg/L whilst SPE remained negative and a bone marrow biopsy revealed 40% plasma cells. Treatment with Rd (lenalidomide, dexamethasone) was commenced and the patient remains in complete remission, 10 months later. This case demonstrates that monitoring with sFLCs allows early detection and monitoring of FLC escape.